I have a reason to be biased against this particular hotel as we had some money stolen whilst staying there. This has however had the opposite effect. The negative comments in this post are ones I’d already planned to write before we knew about the money being stolen, and I’m very happy with the response from the hotel in dealing with the incident. Even before the incident I had already decided that this was not a hotel I want to stay at again. 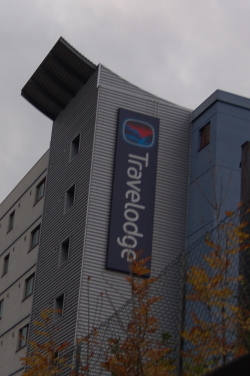 Unfortunately the biggest concern is not the fault of Travelodge, just due to it’s poor location. When visiting London we have previously stayed at hotels on the outskirts of London. In the past we’ve stayed at Heathrow (not recommended due to the difficulty in getting to the tube station located inside the airport), and Wembley Park at the Premier Travel Inn Hotel. As we’d stayed at Wembley before so when I saw a Travelodge I thought that would be in a nice area. Unfortunately the location of the hotel was nothing like that of the Travel Inn. The hotel was easy to find by car as it is just off the North Circular road. There was on-street parking directly in front of the hotel for free or a enclosed car park at £5 per day. I park in the car park and I’m glad I did as during the night we were staying a car on the road was broken into (I suspect for the car’s Sat-Nav). The car park was covered with signs saying that this was a high crime area and to ensure that nothing was left in the car. We were too early to check-in, but we made sure we removed all the valuables and left only our clothes in the car. We did not leave anything in the car overnight. The hotel is located a good 10 minutes walk from the nearest underground and overground train station, Stonebridge Park. There is also a bus that goes past the underground station and runs about 4 times per hour during the main part of the day. It would however recommend taking the bus (if you have an underground day ticket then the bus travel included in the price). Walking to the station takes you past some boarded up buildings littered with rubbish, a biker’s cafe and under bridges covered with pigeons. We saw numerous empty beer cans some discarded needles and a rat. There was even and area cordoned off by police. We arrived at the station safely, but it didn’t really fill us with confidence. The room itself was very nice. Due to Travellodge policy there is only a single bath and hand tile, and only two pillows on the double bed. It did say that additional towels and pillows were available from reception, but when we asked they had towels, but no pillows. This is not acceptable. If they want to save money by providing these on request that is one thing, but they need to be able to honour that, which clearly they failed with. It would be far better if they included extra pillows and towels in the room, perhaps on top of the wardrobe so that they are available if required. We had breakfast in the hotel. It was a reasonable cost (even cheaper is bought when booking the room) and included a self-service full English breakfast as well as cereal, toast, fruit and croissants. Whilst we were having breakfast someone went into our hotel room and stole cash from handbags which had been left there. The only thing that was taken was notes, all the cards and other valuables in the room were left. We didn’t realise that the money had gone until we had already checked out of the hotel, but as money was taken out of two separate bags that had only been left unattended during breakfast it was obvious that was when it was taken. We reported the theft to the police by phone; fortunately we’d seen adverts with the police phone number on the tube – 0300 123 12 12 (999 is for emergencies only) which was easier to remember than trying to find the number of the local police station. We also cancelled all the cards as although they were not taken there is a risk that they may have copied the details. We then reported it to the hotel when we returned. We spoke to the duty manager who was very helpful. They had an engineer visit to check the door reader and found that a member of staff had entered the room. The hotel accepted responsibility and have refunded the stolen money. They have not identified the individual that went into the room but from the information they gave me I am confident they are taking steps to catch the criminal and to try and prevent it happening to anyone else. They clearly considered it a crime against the hotel as well as against us as guests. The location is not very nice. If you are travelling everywhere by car then it’s not such a big deal, but it is not pleasant walking to the underground station. This is the biggest reason that I won’t be staying at the hotel again. The other reason is that they were unable to provide the pillows despite their promises. Having money stolen was unpleasant, but I don’t consider this a negative aspect of the hotel as they handled the incident very well. This entry was posted on Saturday, November 1st, 2008 and is filed under Babies, Children, General, Holiday, Tourism. You can follow any responses to this entry through the RSS 2.0 feed. Both comments and pings are currently closed.